Includes the latest equipment in prospecting, mining and electronic metal detecting. This best seller has been reproduced in Color by popular demand and contains new product reports on some of the latest and most popular equipment. 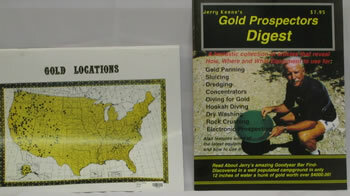 A fantastic collection of articles that reveal how, where and what equipment to use for Gold Panning, Sluicing, Dredging, Concentrators, Diving For Gold, Hookah Diving, Dry washing, Rock Crushing, and Electronic Metal Detecting. Read about Jerry Keene?s amazing Goodyear Bar Find in a well-populated campground in only 1/2 inch of water. A nugget worth over $4000.00! 8" x 11". 51 illustrated pages.